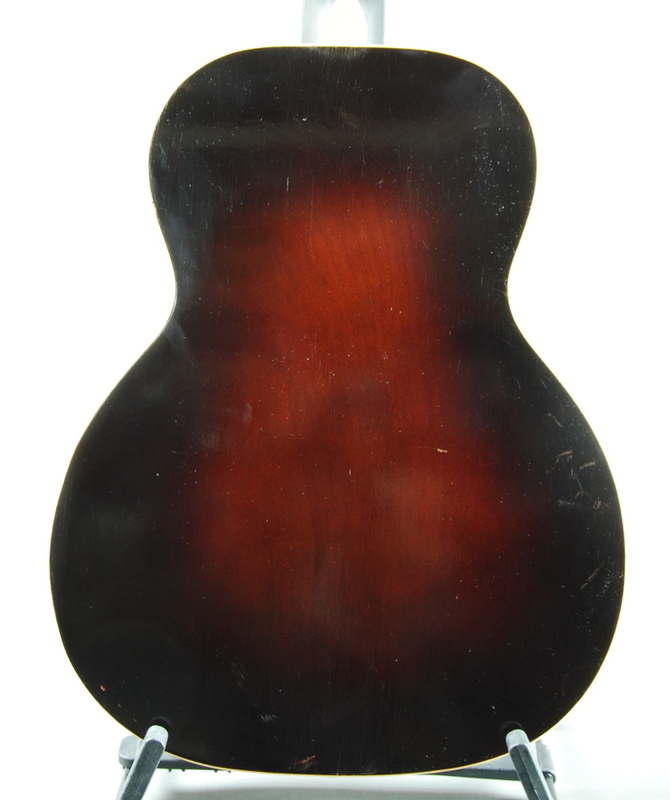 Regal ‘Radio Tone’ c 1939 | SOLD | This Regal-made (Chicago) ‘Radio Tone’ flat top, ladder braced, with a spruce top, tail piece and adjustable bridge, is a successful combination of both flat top and arch top guitars. The ‘Radio Tone’ line was produced by Regal from the late 30s into the 1940s. Some proffer the idea that these were made by Regal and marketed along with guitar lessons. A likely conclusion since it states on the colorful label inside “Sold Only With Radio Tone Guitar Lessons”. However, no supporting evidence, such as the actual ‘Radio Tone’ lesson books, have surfaced to our knowledge. This instrument is made from quality materials. The top appears to be solid spruce, while the back and sides are mahogany (the back is one piece), bound top and back in white celluloid. The top and back both sport a rich sunburst. The neck is likely mahogany with a Brazilian rosewood fingerboard, bound in white celluloid. The headstock is black stenciled with a distinctive ‘Radio Tone’ graphic in white. The bridge is rosewood with adjuster wheels, and the tailpiece is engraved ‘Radio Tone’. Tuners are original. The body across the lower bout measures 14 1/8”, and the scale length is 25 1/2”. The neck measures 1 13/16” across at the nut and 2 1/8” across at the saddle. The neck is carved in a full ‘V’ shape, typical of the era. The guitar retains its original luster, and is in near-mint condition with only a few light scrapes or dings, and some light checking on the sides. The are no apparent repairs except for a recent neck reset. The guitar plays easily with a comfortable action, and produces a hybrid sound somewhere between a ladder-braced flat top and and ‘30s era arch top, a unique coupling that lends itself to country fingerpicking or jazzy comping. Comes with its original Geib soft case in very good condition.